When African slaves were brought to Cuba in colonial times, they weren't allowed to openly practice their African religions. Generally, they were forced to convert to Catholicism and show at least outward appearances of practicing the faith of their Spanish masters. Behind the veneer of Catholicism, however, Afro-Cubans kept their old religions alive by "syncretizing" their deities with Christian saints. They knew that the Virgin of Charity was not really Obatalá, but they saw some similarities between the two that allowed them to secretly worship Obatalá while appearing to worship the Virgin. 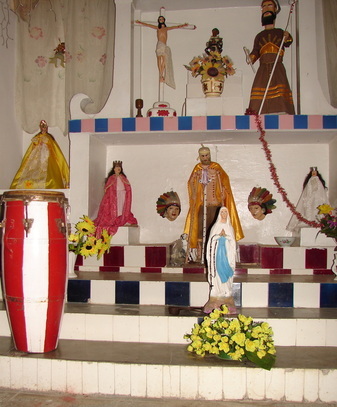 Even today, you might find statues of Catholic Saints on the altar of a practicing Santero, but there'll be another altar somewhere in the house where the African symbols of the Orichas are kept. The two are never really confused in the minds of practitioners. The Orichas are complex, mystical beings, and their essence can't be expressed in a single image or form. They exist in the form of divine energy that is all around us and lives within us. There are many patakíes (sacred stories) about the Orichas that explain their origin, their life on earth, and their relationship with God and each other. Each Oricha has a distinct personality.